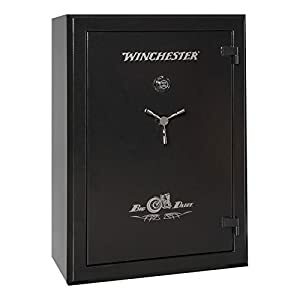 #1.1 Top 7 Gun Safes from Winchester! #1.2 Why Choose Winchester Gun Safe? Gun safe is an absolute necessity if you are a gun owner. You have to have something that secures your firearms, ensuring that some person does not accidentally use them or take them away from you. This is why you want to ensure that you have a top safe. Winchester has long established themselves as one of the best brands on the market, not only for firearms, but also for safes. You need something that is coming with a reputation that you can count on, and Winchester has earned that reputation by developing a number of safes that are perfectly designed to fit your needs. 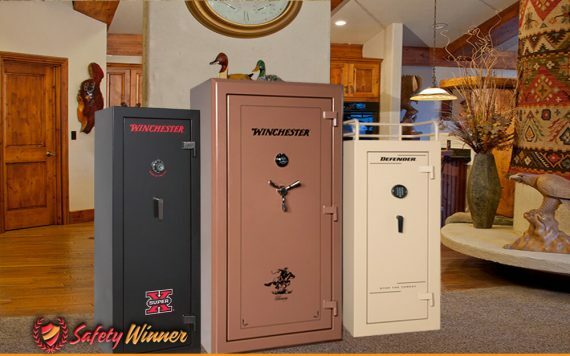 Top 7 Gun Safes from Winchester! While you can depend upon the quality of all Winchester safes, not everyone specifically fits your needs. If you are trying to find the ideal one for your home or business, here are seven great options for you. Gives you fireproof protection for up to 45 minutes. Can hold up to 38 firearms. Well designed to enable you to be able to customize to fit your needs. Comes with interior door panel to add additional organization, including for your handguns. Built to be resistant to attempts to gain unauthorized access into the safe. Comes at a price that is far superior to that of similar quality safes. Larger sized weapons will keep you from being able to store 38 firearms. Really no other complaints about the safe. 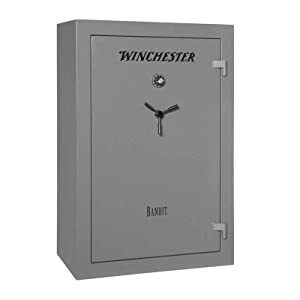 While you want a quality safe, space may be a major concern for you, and this is why you may find this Winchester safe to be the perfect option for you. While having a capacity to hold up to 38 different firearms, it does so by taking up a minimal amount of space, with it being 60 inches tall, 40 inches wide, and 22 inches deep. The additional depth gives you the ability to use different forms of gun racks within the safe so that you can take full advantage of the depth. Plus, the safe comes with adjustable shelving to allow you to customize to fit your needs. Fire protection is one of the things that is separated Winchester from many of the other brand names you will find, and you will be satisfied that the safe provides you with at least 45 minutes of protection at temperatures reaching 1400°F. The door seal expands to six times its size when subjected to heat, creating the perfect barrier between your valuables and the smoke and heat surrounding it. There are a number of other features about the safe that will give you greater peace of mind. The locking bolts are made with 1.5 inch steel making the safe virtually pry proof. Plus, it uses heavy gauge steel that is resistant to attempts to drill or use brute force to gain access into the safe. The safe uses a quality type II combination lock, which you are able to program to create your own code. It is drill resistant as well, giving you a safe that you will truly love. Plus, despite all of the additional features and quality of the safe, it is one that is built to accommodate the budget of most to have a larger volume of weapons. Truly a fantastic safe that you will love and which will give you a lot of confidence that the things that matter to you most are well protected. Provides 75 minutes of protection in temperatures up to 1400°F. Provides 14 different 1.5 inch solid steel bolts. Safe is pry, drill, and impact resistant. Provides all hardware needed to secure the safe in place. Single power outlet included inside. The design of the safe makes it hard to get items out of the back of the safe without removing items from the front. This is a big safe, weighing over 800 pounds. The Big Daddy series of the Winchester safe is such a spectacular group, that it’s hard to single out which one is better than any others. The truth is that it is all about the size safe you need that is the determination, as you can be sure that each one of these is built with incredible craftsmanship. Each of this series safes provides up to 75 minutes of protection at 1400°F, giving you plenty of time to get emergency personnel to put out a fire before your valuables can be destroyed or damaged. The Paulson heat expanding door is included as part of the design, enlarging the liner in the door up to six times its original size to block out smoker heat from getting into the safe. Inside our zippered pockets that have thermal linings. This means that important documents or media that you are storing in these pockets will get additional protection. The body is made of 12gauge steel. This will help to thwart any attempt to break into the safe, and the company provides a lifetime warranty should the safe be damaged by an attempt to gain unauthorized access into the safe. An electronic keypad is used which is programmable, allowing you to set your own code. There are 14 different bolts that are used to lock the door in place, each 1.5 inch thick and made of incredible steel. Plus, the bolts are even included on the hinge side of the safe. Because the door is recessed, this safe is as anti-pry proof as it gets. The safe comes with predrilled anchor holes and with all of the hardware necessary for you to be able to secure the door to a wall or to the floor. There’s a single power outlet that is included inside the safe as well. A fantastic model no matter which choice you make in the series. Provides up to 60 minutes of protection at temperatures reaching 1400°F. Durable 16gauge steel protects the safe. Solid steel shelving used for interior. Additional fire protection included through use of thermal pockets. Built to handle up to 46 firearms. The safe that professionals use. There is no way you can move the safe on your own as it weighs over a thousand pounds. Would be difficult to get 46 firearms in here. When police and tactical professionals use a specific kind of safe to store their firearms, you can be sure that you are counting on a quality product. That is what you will receive with this Winchester Defender safe. This has become one of the more popular safes that you are going to find on the market, starting with the fact that it is able to store as many as 46 different firearms. There are 24 slots specifically designed to hold long rifles, and 22 additional spots for handguns. Plenty enough space for any gun enthusiast. This safe provides you with 60 minutes of protection in temperatures up to 1400°F. Like all Winchester safes, this uses the Palusol heat expanding seal door, where the lining will expand to six times its size when placed in extreme temperatures, which adds is a protective barrier against heat and smoke. Plus, interior linings to pockets in the door add additional thermal protection. 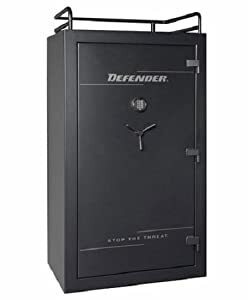 The safe is made of a 16 gauge steel, ensuring that you’re getting maximum protection not only from fire but also from those looking to gain unauthorized access. The door is built to be pry resistant as there are 1.5 inch solid steel deadbolts that are used to secure the door in place when locked, and a recessed door then makes it virtually impossible to pry it open. The interior door is designed to give you greater organization by adding holsters and pockets. Shelving is able to be adjusted to accommodate your needs. Plus, it is all built with solid steel, knowing you are getting quality shelving that is durable and will last. When professionals are confident that this safe will help to keep their firearm secure, you can be sure you’re getting the same kind of confidence. Why Choose Winchester Gun Safe? Fire protection. All of their safes offer you protection should you ever have a fire in your home or office. Not only are they built with durable steels that keep heat away from your valuables for at least 60 minutes, but the Paluson door seal is designed to expand to keep smoke and heat out during a fire event. Guarantee. One of the things that truly separates Winchester from other brands is that they stand behind their products. There is a lifetime warranty should a burglar ever gain access into your safe or if the safe is damaged because of an attempted burglary or because of a fire. Winchester will replace it, no questions asked. Outstanding Products. You can provide that kind of protection when you make quality products, and that is what Winchester has done here. They have made safes that are drill, pry, and impact resistant, keeping your valuables safe from those who would attempt to take them. Well Designed Interiors. Not only does the interior of these safes offer you the functionality to customize the shelving to fit your needs, but they come with a door panel that allows you to secure and organize handguns and other valuables. Plus, you often receive USB ports and an outlet as part of the design. Trusted. Of course, Winchester has long established themselves as a brand you can depend upon. You will find that many professionals use this as their product, even in professional locations, such as police stations.